Payment allocation is the term used to describe how your credit card company uses your payments to pay down your debt. The Credit CARD Act, effective February 2010, has changed a lot of the rules regarding how your credit card company can distribute your payments across different APR balances. The new rules are aimed at protecting consumers from an unfair payment allocation system, but unfortunately these rules only apply to consumer credit cards, and not small business credit cards. Below you will find separate explanations of how payment allocation works for both types of credit cards. Let’s say you have a personal credit card account with $100 of balance transfer debt at a 0% APR, $100 of purchase debt at a 10% APR and $100 of cash advance debt at a 15% APR. That’s $300 of total debt (see image below). Now let’s imagine you send your credit card company a payment of $100. It used to be that nearly all credit card companies would use your payment to pay off the debt with the lowest APR first. This was of least benefit to the cardholder because it meant that the credit card company would continue to assess the highest APRs for the longest period of time, thus maximizing their profits from interest charges. Your $100 payment, in this example, would have paid off your 0% APR balance first, leaving your 10% and 15% APR balances to accrue interest for the credit card company to collect. As of February 2010, however, the CARD Act has prohibited this disadvantageous payment allocation system and requires credit card companies to apply consumers’ credit card payments to the highest APR first. It is important to note that this rule only requires that payments above the minimum payment be applied to the highest APR balance. In this example, if your minimum payment is $20, then that amount would still go towards your lowest APR balance (0% APR in this case). 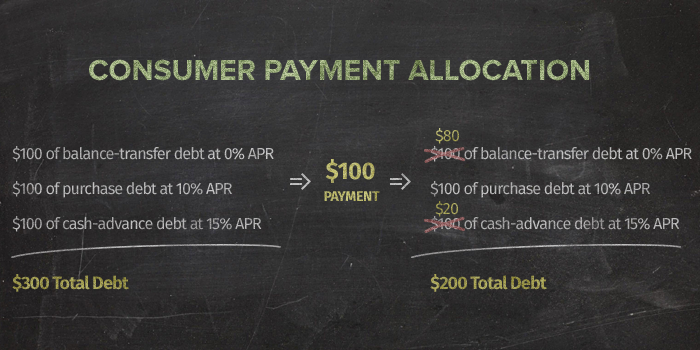 The remaining $80, however, would go towards paying down your highest APR balance (15% APR in this example) – leaving you with a lot less debt at the highest APR. Since the Credit CARD Act only requires credit card companies to apply your payments above the minimum to the balance with the highest interest first, we strongly advise that you pay more than 15 % of your credit card balance each month to take advantage of the new payment allocation rules. If you know that you’re not going to pay at least 15% of your balance every month, you should have a separate credit card for your balance transfers, a separate card for your purchases, and a separate card for your cash advances. This way, you can fully control how your payments are allocated towards the different APR balances. More than 80% of small business owners use credit cards each year and roughly 30% use plastic as their primary spending vehicle. 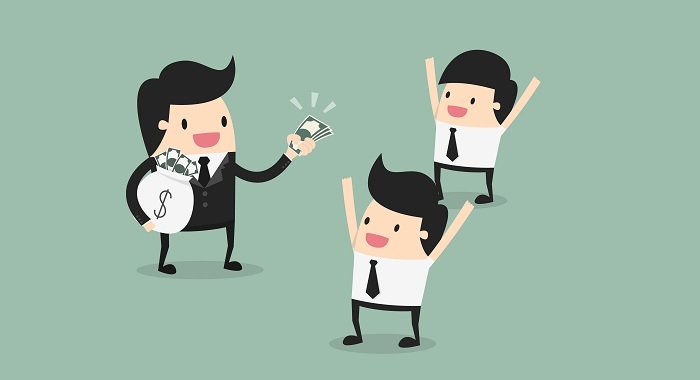 So, if you own your own business, chances are you’ve encountered a situation like this one. Let’s say you have $100 of balance transfer debt at a 0% APR, $100 of purchase debt at a 10% APR and $100 of cash advance debt at a 15% APR. You then send your credit card company a $100 payment. Because small business credit cards are not protected under the Credit CARD Act, nearly all credit card companies will pay off the debt with the lowest APR first. This is a big disadvantage for you because it means that the credit card company can continue to assess the highest APRs for the longest period of time, maximizing their profits from interest charges. Your $100 payment, in this example, will pay off your 0% APR, but you’ll still have the 10% APR and 15% APR debt loads on your account. Although the payment allocation rules from the Credit CARD Act only apply to consumer credit cards, some credit card companies have gone ahead and applied the same consumer-friendly rules to their small business credit cards anyway. That means that some credit card companies will apply your payments (above the minimum payment) to your highest APR balance first (15% APR in this example), instead of your lowest APR balance. Therefore, you should read the terms and conditions of your credit card agreement carefully to see if the old rules for payment allocation still apply. If they do, you may want to consider applying for a small business credit card that uses the new payment allocation system. Even if you find a small business credit card that uses the consumer-friendly payment allocation system, credit card companies are not obligated under the law to maintain that policy and there is a chance that they could revert to the old rules. Therefore, your best bet is take precautions to keep costs down in either scenario. To keep costs down with the old payment allocation rules, we strongly recommend you avoid mixing-and-matching the transactions you make on a single card. 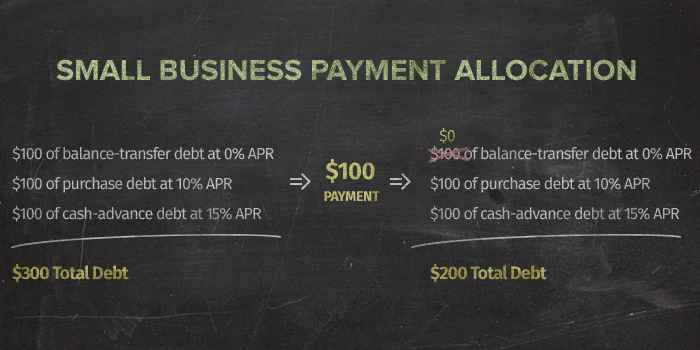 Unless your small business credit card has the same APR at all times for all types of balances (i.e. balance transfers, purchases, cash advances), you should have a separate card for each of these functions. Otherwise, you won’t be able to pay off your highest APR balance until you have finished paying off all of the lower APR balances. This could be a big problem if, for example, you had $1,000 in new purchases at 15% APR that you couldn’t pay down until you paid off your $10,000 in balance transferred debt at 7% APR. If you need to both transfer a balance and make new purchases for your small business, consider applying for two credit cards: one with a low balance-transfer APR, and one with a low APR for purchases. company financed an item and structured the account as a "revolving account." They then applied several minimum due payments to principal and nothing to interest. They later applied larger payments to "back interest." Is this normal? I have potential scenario here. In an effort to pay down debt, but not change creditors ; is it possible to borrow against an account (balance transfer check @0% for 14 months) and pay back a lup sum to eliminate a high APR balance? I could probably avoid the confusion by giving busyness to a different credit card company but i like the one i owe. does that mean $7900.00 will pay down the $8k @ 11.25% and the $100 will pay down the new debt by $100? Ive already considered the transfer fee in comparison to the 14 months @11.25% to be a significant savings. Need some advice...i have not cashed their check yet. in today's high credit card interest climate NONE of the examples I've seen explain one very important aspect to allocation of payment over the minimum amount. The problem is the interest amount connected to the higher interest rate is added to that balance before it's taken back away from it with a higher than minimum payment. Even if one pays the more than the minimum, the interest in each category is added to that category before any payments are applied. Therefore, the higher rates' interest amounts(in dollars) must be paid before their balance is reduced. This is a key point to reduce your balance on the higher interest rates. Why don't any of these sites and forums explain this? I called Bank Of America and had to speak with a supervisor before this above the minimum payment allocation was understood and how to reduce that higher balance was possible. This interest dollar amount above the minimum is significant sum because it's based upon a higher interest rate. This must be paid first before that balance is reduced.